The soup theme continued as well, with the cheesy potato soup, and a pot of turkey-rice. I always make enough for more than one meal, when I make soup. I can’t seem to help myself. Ja’Ana made cornbread again this week, and my sister made some on Sunday. On Sunday, along with all those potatoes, I did baked, breaded chicken, which was a hit as well. I think we were all in the mood for heartier fare–fall is certainly here along with it’s rain, and wind, interspersed with a little sunshine now and then. One day, I put round steak into the crock pot and made Swiss Steak. I made some gravy to go with it, and those purple mashed potatoes. There is still some of that left, so we will probably eat it again tomorrow. Jake convinced me to make Rice Krispie treats (from gluten-free Malt-0-Meal Rice Krispies), and he took a big plate full home for his Mama. He hung with us today, as there was no school. We did a slew of errands–everything from getting medicine, to getting the oil changed in the car. We slipped in some duck-feeding, and had lots of library books in the car to make it fun. We got him a Happy Meal–I had a coupon for buy one, get one free, so he and Patsy both had one. She’s old enough to actually be able to eat more than that, but it satisfied her to get to have it and he was literally starving today–nice! There were lots of salads this week–for lunches with chicken or for dinner along with the other food, cooked home-canned green beans, home-canned peaches and applesauce, hot dogs, sandwiches, corn chips with salsa, and pork and beans. Patsy eats cold cereal almost every day, and Rob and I eat eggs almost every day for breakfast. Lovana gets a crepe or sandwich for free from work on the days she works, and pretty much makes her own food the rest of the time. Sometimes, I eat at my sister’s house in the evening, as I don’t get done until 6, and everyone at home just makes their own, or eats leftovers. Sometimes, I go home and make a salad, or warm up leftovers on the days I work. It has turned out that I only really need to cook 4-5 main recipes a week, and there is enough for the week to just warm up leftovers. This coming week, it’s going to be all about cleaning out the fridge so we can fit the Thanksgiving food in there the following week. I’m not sure what I’m making, yet, but I’ll work on some planning tomorrow, and hopefully, I won’t get carried away, as I have an entire day at home….at least that’s what my planner says. So, if I decided to go somewhere, it will be purely for fun. Should be a great day, either way. The potato deals are happening here as well so it is potatoes to eat here, too. I cooked the last of a bag of red ones last night and cooled enough cubes to make three more meals for us and put them in ZIploc in the freezer. I will be glad I did it later. We have 5 pounds of yellow potatoes and 5 of Russets on hand but I am hoping for an Aldi deal on red skin ones next week for Thanksgiving. I have been cooking and freezing for Thanksgiving week so that I am not in the kitchen the whole time the kids and grands are home. Yesterday I browned the meat and veg for a big pot of chili and put that in the freezer along with cinnamon rolls. Today I plan to prep and freeze for my breakfast casserole. Jake is making me want rice krispie treats! Maybe I need to make them for supper for Thanksgiving Eve when we will have others here to help us eat them. 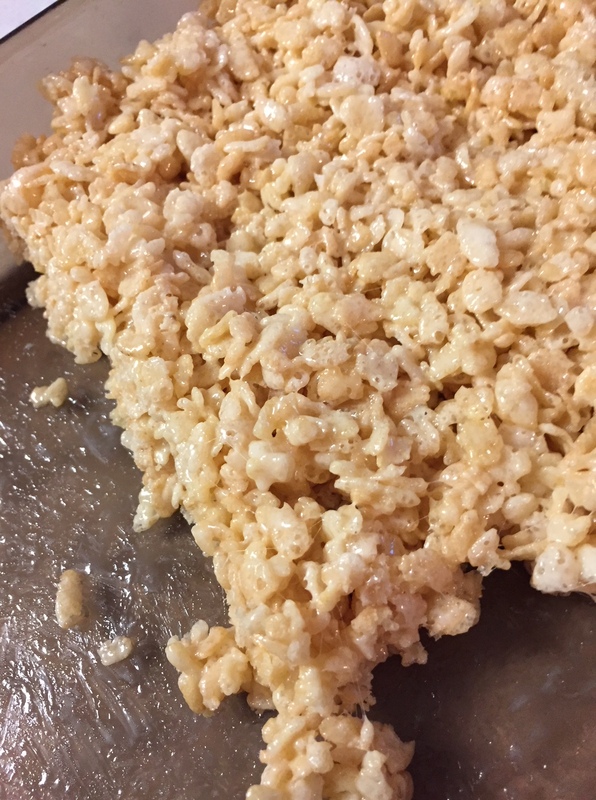 I just love the Krispie treats, too–the homemade kind. I got boxes of them for 50c/box and sent them all to Rob’s work. You can’t send homemade there, but the taste is so much better. But, the kids love the boughten kind, anyway. I’m doing things ahead for Thanksgiving, too. We also have been doing a bunch of cleaning because we are really busy with the kids the actual week of Thanksgiving–no school for any of them. Love potatoes and we could eat them every meal.. 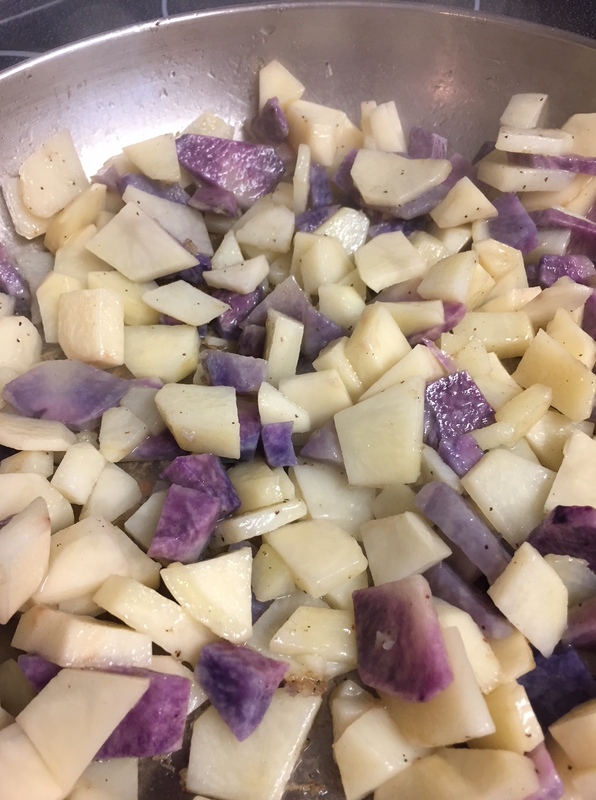 The purple potatoes looked pretty in the mix too. It’s been a real challenge to adjust to only 1 fridge and 1 oven at holiday times! But, we are managing, especially with the camper fridge to use in a pinch. I do tend to get a crammed fridge, though. I am even going to cook the turkey ahead of time so the oven has an extra rack available on the day of Thanksgiving. I do have crock pots and a roaster pan that I may use. Problem is…there’s not enough counter space to put out a bunch of appliances and serve all the food, too. I’m still thinking it through! But, I think I’ve got a pretty good plan in mind. Good luck getting yours cleaned out! Thanks for stopping by my blog. You are so right about how we think we have to have a different menu every night! I had never really thought about how that is somewhat uniquely American. It is really kind of stressful when you have to work so much. I am enjoying just intentionally planning only a few meals a week and eating leftovers. I agree! Since I get home around 6:30 on 3 nights per week, and usually have appointments for kids the other 2 late afternoons, dinner prep has become a big challenge. But, I’m getting it figured out!